Manifest Blog: Why Doesn't God Speak to Us More? It’s encouraging to see so many wanting to hear God’s voice over any other physical encounter with God, but why aren’t more hearing the voice of God. I think it has to do with our prayer lives. Most Christians have a very shallow personal prayer life. We pray in church, and we pray over our meals, and sometimes when struggles come up in life or if we really, really want something, we pray for help. Our corporate prayer life is even more dismal, in that we might have a Sunday school prayer and a prayer during service, but there’s not much beyond that. And the average duration for any of these prayers? Less than 5 minutes. According to a recent Gallup poll, the average Christian in America spends one hour a week praying. One hour a week for the Almighty God, that’s all we can spare. Muslims are required to pray five times a day facing Mecca, each of these prayers are 10 – 15 minutes in duration. So that’s about an hour a day. Hindus pray and meditate at least three times a day, usually lasting several minutes, hours, or days. Buddhists meditate for hours, days, and sometimes months at a time. It doesn’t really matter which direction you turn all the other religions spend more time in devotion to their deities then average Christians do. Why? Exodus 20:18-19 has the answer. God has just called all the Israelites to meet Him on the mountain. He’s delivered the ten commandments audibly with a visual display of His glory, and it says, “All the people perceived the thunder and the lightning flashes and the sound of the trumpet and the mountain smoking; and when the people saw it, they trembled and stood at a distance. Then they said to Moses, "Speak to us yourself and we will listen; but let not God speak to us, or we will die." God is offering to be their God and offering a relationship with them unlike any other in history since the fall, where He will talk to them audibly, and they reject it out of fear. Just like the Israelite’s on the mountain, God has offered us a personal relationship with Himself unlike anything offered before. To have Him dwell within us and redeem us, yet we don’t pray as often as these other religions. Why? I so love praying to God. It is such a great time to connect with my Father. It has not always been like this however. But the more I taste and see He is good, the more I want. Thanks for the tip on the ICR article on my blog, Stephen! I put your blog on my links list. I, too, would pick hear God. I cannot see Him the way I wish to see Him until I myself am transformed. So to hear Him quite clearly in difficult situations would be my choice. Of course, that means sometimes I wouldn't like what I heard. Yes, I am the radaractive guy and also the AmericanVet guy because I have multiple blogs. Oh, and I believe that it was Margaret Becker who sang that it isn't that God isn't speaking, it is that we aren't listening? Or was it Christine from OOTG? Well, I sure grew the comments thread anyway. Great post Stephen! 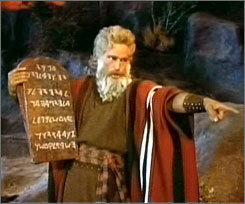 We actually just studied that passage from Exodus in our Sunday School class. Just like those from long ago we fear hearing from God. Mainly it's because of the accountability issue - (we might have to actually do something! ).